What dress style will look beautiful on my short pear shaped body? I am short and have a pear shape body and like flat shoes to wear. Please tell me what dress style will be beautiful on me. Jane's answer... Sara, thank you for your question and for including pictures. I'm assuming these are the styles of dresses you like? 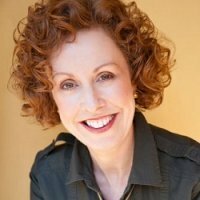 Or at least the styles that you think might work for you? 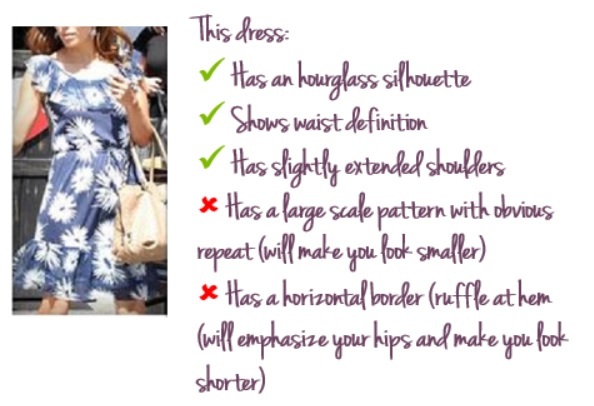 You've given me information about some of your proportions (great) and I'm guessing those are the challenging aspects for you when trying to find dress styles that suit your proportions and preferences? 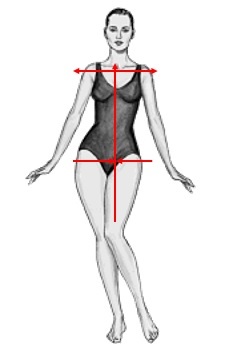 I'll assume that you have a balanced vertical proportion (that is your legs and torso are about the same length), a reasonably well-defined waist, average or small bust, average neck length, and slightly tapered shoulders. Have at least a small sleeve, or a slightly extended shoulder line, but the shoulder seam should not be overly dropped. This will appear to balance your hips to your shoulders. If you are no more than 1 dress size different between you top and your bottom halves a sleeveless dress will probably work for comfort on the hottest days. Have a skirt that falls in a sutble A-line - even if the dresses' skirt is a full A-line when it's held out if it's in a soft, drapey fabric it will fall either straight or as a subtle A-line. The wider your hem appears the shorter and wider you will appear. Keep in mind - the longer your dress the shorter you will appear. Wearing skin-toned sandals or shoes will help to make your legs appear longer. At least a small heel or wedge or platform would also help. The overall shape of the dress above has a distinct A-line. Although the skirt silhouette is a subtle A-line, when it's combined with the horizontal stripes, the length and the lack of sleeves the overall effect will be to emphasize, rather than balance, a pear shaped body. The 2 leaf-print dresses on the right may seem to be a print that's too large. However, because the print is made up of smaller elements and the patterns are complex and diagonal rather than horizontal they should still work for your petite frame. Of course the colors of these dresses may not be right for you. And they may not suit your personal style preferences. However, these shapes and patterns will all be good for your shape and frame. How to be a stylish pear shape when over weight? Comments for Pear shape body best casual dress style? I take it that you prefer to wear your dresses longer than knee length? I suggest you choose a length that you're comfortable wearing. Are you comfortable wearing dresses that end somewhere between your full calf and lower knee? If so, wear that length. Just make sure the hem doesn't end at your full calf. Be aware that the longer your dress the shorter and heavier you will appear. If you wear heels the longer lengths will be more flattering. Dresses that fall straight, or that are slightly tapered will also help you appear taller and slimmer. So avoid obvious A-line and very full styles. I am a pear shape body with average length. I am not comfortable wearing knee length dresses. So could you just advise in that case what are my other options regarding the length of my dress.